On April 4th at 6 pm, the Preston Trail Chapter NSDAR will host a program given by Carolyn Schiewe. She is the District II Director TXDAR, a sixth generation Texan and a descendant of some of the earliest settlers of this country dating back to Jamestown, Virginia. After researching 18th century clothing from the period of 1760 to 1780, she created the Colonial Style Show about 13 years ago. All dresses displayed have been hand made by Schiewe. It takes about 10 yards of fabric for each dress and involves about 65 hours per dress. The colonies did not have any weaving houses so all the fabrics at that time had to be imported. Fabrics imported were silks, satins, velvet, brocade and damask. Schiewe has presented this program more than 50 times to DAR chapters all over North and Central Texas. The fashion show includes models displaying five different styles of dresses. Please join us for this wonderful event. For the meeting location please contact the chapter at PrestonTrailNSDAR@gmail.com. 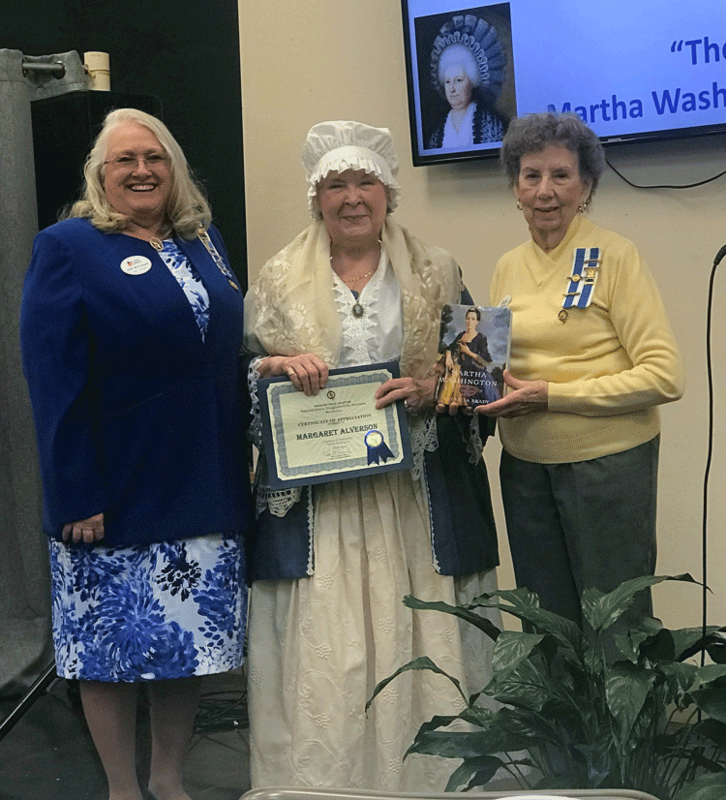 Last month, First Lady Martha Washington shared her reminiscences at the Preston Trail NSDAR Meeting at 6 p.m. on March 7, 2019. Representing Martha Washington in period dress was Preston Trail chapter member Margaret Alverson. It was a very moving, engaging and fun look back at Lady Washington. Thursday, May 2, 2019 will be the chapter’s annual awards gala. Reservation for this event are required be sure to include this on your calendar. The cost to attend the gala will be discussed/approved at the April meeting and announced shortly after. Four daughters from the Preston Trail chapter went to the 120th Texas State Conference in Houston, Texas. DAR Daughters who attended were chapter Regent Vicki McComack, Treasurer Lisa Lettie, Incoming 2nd Vice Regent Michelle Alverson, and her mother Barbara Smith. At the Conference, the chapter was honored to be awarded by Texas DAR for First place in Historical Preservation Committee Contest. The Preston Trail Daughters and several Prospectives indexed and sorted genealogical books and data received by Frontier Village from the three local libraries. Lisa Lettie, Historical Preservation Committee Chair, coordinated and energized the Daughters and is to be commended on the wonderful preservation of important historic data that would otherwise have been lost to Grayson County. The Preston Trail NSDAR will participate in the Medal of Honor Parade to be held in Gainesville Texas on 13 April 2019. The Daughters will ride dressed in Period Clothing on a float they built in honor of the military. Would you like to be part of our meetings and be able to listen to the interesting speakers we have each month? You are welcome to come and see what the DAR is all about even if you are not a member. Would you like to be involved in the good works that DAR participates in? Anyone interested in receiving help to prove their ancestry for qualification to become a Daughter of the American Revolution are welcome to contact our chapter at www.facebook.com/PrestonTrailNSDARPottsboroTX75076 on Facebook or www.DAR.org. The National Society Daughters of the American Revolution was founded in 1890 to promote historic preservation, education and patriotism. Its members are descended from the patriots who won American independence during the Revolutionary War. With more than 177,000 members in approximately 3,000 chapters worldwide, DAR is one of the world’s largest and most active service organizations. DAR members are committed to volunteer service having served more than 12.5 million hours in communities throughout the world during the past three years. To learn more about the work of today’s DAR, visit www.DAR.org or connect with DAR on social media at facebook.com/TodaysDAR, twitter.com/TodaysDAR and youtube.com/TodaysDAR.